Related links to "Aus-Rotten - …And Now Back To Our Programming LP"
USA-IMPORT!!! The second studio LP from AUS-ROTTEN, originally released in 1998, is back in print on PROFANE EXISTENCE! 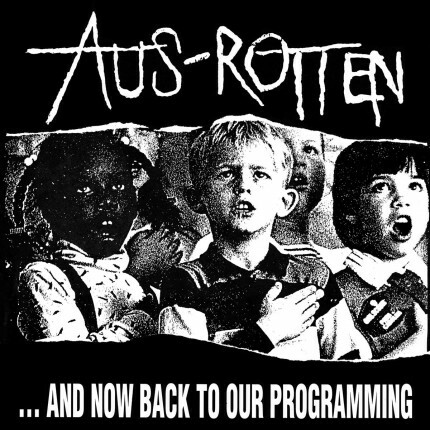 Considered by many to be the highlight of AUS-ROTTEN’s discography, “And Now Back To Our Programming” is an absolutely essential anarcho-punk LP, and the rapid fire delivery of righteous political anger AUS-ROTTEN are famous for is just as prevalent on this release as it is on all AUS-ROTTEN records. From the second the needle drops this LP challenges you to be the change you want to see in the world. 7 songs in total including the epic 16-minute title track.